Valeri Kharlamov played fourteen seasons with the Soviet Red Army, helping his team claim an unprecedented eleven league championships. As the political Cold War warmed enough to finally allow fans to witness international competition between the Soviet Union and North America, Valeri Kharlamov emerged as the dominant Russian left winger through the seventies. Born January 14, 1948 in Moscow, Kharlamov combined superior hockey intelligence with outstanding natural talent and established himself as one of the most formidable weapons in the dominant Soviet arsenal during the decade. "His talents were God-given and he could do practically everything  a smart play, a tricky pass, a precise shot," said Hall of Fame goaltender, Vladislav Tretiak. "Everything he did looked so easy, so elegant. His execution of hockey was aesthetic and he amazed millions." Through fourteen seasons with the Soviet Red Army squad, Valeri collected 293 goals and 214 assists for 507 points in 436 regular season games and was the integral component on eleven league championships (1968, 1970, 1971, 1972, 1973, 1975, 1977, 1978, 1979, 1980 and 1981). 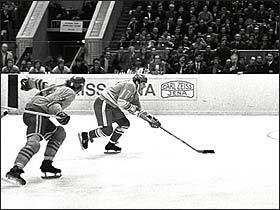 In eleven consecutive International Ice Hockey Federation and European Championships, Kharlamov and the Soviets took eight gold medals, two silver and a bronze, with Valeri named a tournament All-Star in 1972, 1973, 1975 and 1976. He also participated in three Olympic tournaments, leading his Soviet team to gold medals in 1972 and 1976. Through much of his outstanding career, Kharlamov was paired with Vladimir Petrov at centre and Boris Mikhailov at right wing to form the Army Line, one of the most dominating trios in hockey history. (above, right). 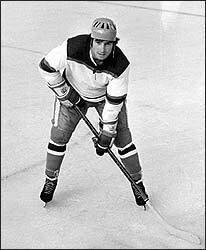 Kharlamov scored three goals and four assists in the seven games he played during the 1972 Summit Series. He missed Game 7 after having his ankle slashed by Canada's Bobby Clarke. In 1969, although just twenty-one at the time, Valeri Kharlamov was recipient of the prestigious Russian sports title, Merited Master of Sport. Kharlamov was posthumously added to the International Ice Hockey Federation's Hall of Fame Honour Roll in 1998. 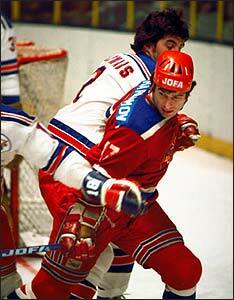 In eleven consecutive World Championships, Kharlamov and the Soviets took eight gold medals, two silvers and a bronze. Valeri was named a tournament All-Star in 1972, 1973 (above), 1975 and 1976. 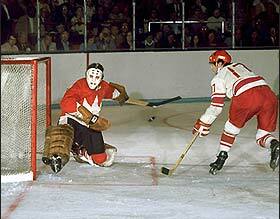 Many will best remember Valeri Kharlamov for his role in the 1972 Summit Series versus Team Canada. So effective was the high-flying winger that in Game Six, Canada's Bobby Clarke took an aggressive chop at his ankle. Although he finished the game, Kharlamov's ankle was cracked. He missed Game Seven and was clearly playing injured in the pivotal final game. Still, Valeri scored three goals and four assists in the seven games he played. Kharlamov also played in the 1974 Pro Classic against the WHA stars, scoring two goals and six assists in the eight-game tournament. In 40 games played against North American professionals, Kharlamov collected 19 goals and 29 assists for 48 points. While still an active member of the Soviet team (his final game was August 18, 1981 in Helsinki versus the Finnish National Team), Valeri and his wife Irina died tragically in a car accident on the busy highway between Moscow and St. Petersburg on August 27, 1981. Ironically, a car accident in 1976 prohibited Kharlamov from participating in the 1976 Canada Cup tournament. Prior to his Hockey Hall of Fame Induction announcement, in 1998, Valeri Kharlamov was selected for the International Ice Hockey Federation's Hall of Fame Honour Roll. Ilya Kovalchuk, the first Russian ever selected first overall when he was the initial pick in the 2001 NHL Entry Draft, was not born until 1983, but offers his homage to Kharlamov's legacy by wearing the number 17 for the Atlanta Thrashers, and insisted on wearing Kharlamov's 17 in the 2002 Olympic tournament as well. Valeri Kharlamov is just the second Soviet-trained player inducted into the Hockey Hall of Fame. Goaltender Vladislav Tretiak, Kharlamov's teammate for many years, was elected to the Hall in 1989. 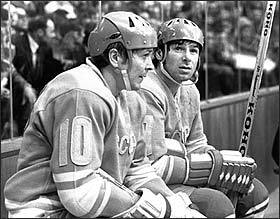 Their coach, Anatoli Tarasov, was elected to the Hockey Hall of Fame in 1974. Sweeney Schriner, born in Russia but raised in Canada, became an Honoured Member in 1962. When the Inductees were announced in June 2005 by the Selection Committee, Kharlamov's son Alexander, himself a first round draft pick in the 1994 NHL Entry Draft, spoke on behalf of his family. "I just want to say thank you for everybody who selected my father in the Hockey Hall of Fame. It's a big day for me today," said Alexander. "I can't believe it! I want to say thank you for remembering my father."